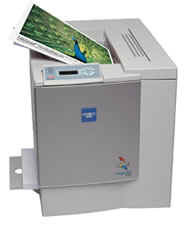 Print Media: Plain paper, thick stock, OHP transparencies, laser-quality labels, and envelopes. Duplexing on plain paper only. Printing on thick stock supported on page sizes of letter/A4 and smaller only. Note: The stated life expectancy of each consumable in your printer is based on printing under specific operating conditions such as page coverage for a particular page size (5% coverage of letter/A4). The actual consumables life will vary depending on the use and other printing variables including page coverage, page size, media type, continuous or intermittent printing, ambient temperature and humidity.